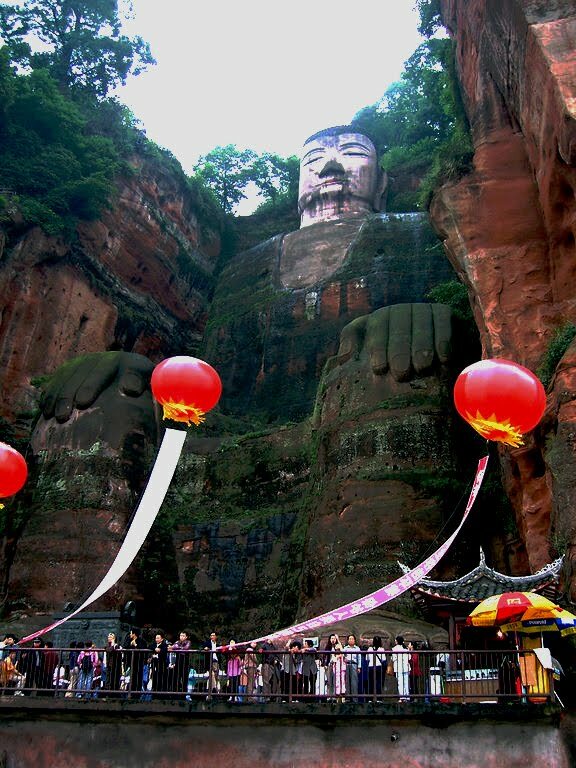 The 231-foot-tall (83-meter-tall) Buddha was carved from a riverside cliff in the 8th century to safeguard boaters on the treacherous waters below. It is carved out of a cliff face that lies at the confluence of the Minjiang, Dadu and Qingyi rivers in the southern part of Sichuan province in China, near the city of Leshan. The stone sculpture faces Mount Emei, with the rivers flowing below his feet. It is the largest carved stone Buddha in the world. At 71 metres (233 feet) tall, the statue depicts a seated Maitreya Buddha with his hands resting on his knees. His shoulders are twenty-eight metres wide and his smallest toenail is large enough to easily accommodate a seated person. There is a local saying: "The mountain is a Buddha and the Buddha is a mountain". This is partially because the mountain range in which the Leshan Giant Buddha is located is thought to be shaped like a slumbering Buddha when seen from the river, with the Leshan Giant Buddha as its heart.